BUT that's not all Dawn has also got some fab candy from her Design Team buddies too. 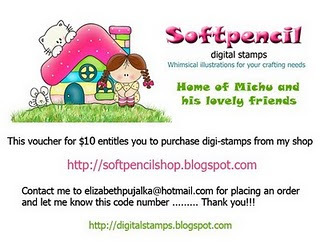 Elizabeth of Softpencil has donated $10 to spend in her shop. She has also had a CD from Ooh La La Crafts donated to the prize fund. So what are you all waiting for my blogging buddies. Pop over to Dawn's to check out the rules, you have until 1st April to enter and the draw will be on Good Friday. Shall we see if we can get Dawn over the hundred followers too!! Thanks for this hun, I really appreciate it. That is one mega candy thanks for the link.